What Is the Glycemic Index of Blueberries? With obesity a growing concern in the United States, many people are turning to special techniques to maintain or lose weight. Excess body fat is one risk factor for type-2 diabetes. The American Diabetes Association estimates that more than 8 percent of the U.S. population had diabetes as of January 2011. The Glycemic Index, a tool traditionally used for diabetes management, is also increasingly being used as a way for nondiabetics to watch sugar intake. Unlike other high-sugar foods, blueberries rank low on the Glycemic Index. In diabetes, too much sugar can raise glucose (blood sugar) levels, and eating too much of the sweet stuff can lead to increased calorie consumption in all groups. Foods are rated on the Glycemic Index (GI) based on carbohydrate content and how much of an effect they have on blood sugar. Rankings range on a scale of zero to 100. Some whole grains and other complex carbs are low on the scale because they have little impact on blood sugar and are thought to be healthier. But it's important to consider that some high-fat foods have low glycemic ratings but aren't necessarily healthy for you. Blueberries are low on the Glycemic Index, which makes the antioxidant-rich food a sound choice for dieters. BL Publications notes that the fresh berries have a GI of 40. Not only do blueberries carry a decreased risk of raising glucose, but they also provide numerous dietary benefits. Blueberries are a natural source of potassium to regulate blood sodium, as well as calcium. They are also rich in the antioxidant vitamins C and E. Also, their high fiber content helps keep you full longer. Blueberries are at their peak season in July. The Academy of Nutrition and Dietetics recommends choosing berries that are dry and firm with smooth skins. Bruising and discoloration indicates spoilage. Organic blueberries are available around the same time of year. Whether you choose organic or not, make sure you rinse the berries thoroughly prior to use to prevent food-borne illnesses. If fresh blueberries aren't available, consider frozen versions. 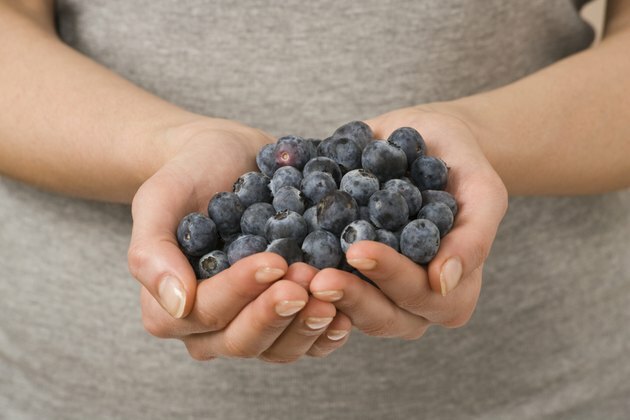 Frozen blueberries without added sugar have the same nutritional components as fresh berries in the produce aisle. With all of the nutritional benefits of blueberries, it's no wonder why this is a go-to food among dieters seeking low-GI choices. Like any food, however, it is possible to eat too much of a good thing. Consider having 1 cup of blueberries at a time to satisfy one of your daily fruit and vegetable requirements. Blueberries aren't a significant source of protein, which is a necessary essential nutrient for immune function, fluid balance and hormone regulation. Consider adding blueberries to protein-rich quinoa for breakfast, or use them to top whole-wheat waffles for special occasions. If you have diabetes, blueberries can be just one healthier method of quenching your sweet tooth.